AT&T BlackBerry Bold on Tour with Madonna! The BlackBerry Bold isn't on sale yet in the USA, but that isn't preventing RIM and AT&T from spreading word of the device to the masses. Just point your browser to blackberry.com/madonna and you can check out all the details behind Madonna's Sticky & Sweet Tour sponsored by RIM and featuring the AT&T BlackBerry Bold. I Just got back from Madonna's Concert, and I'm Happy to Announce that RIM Was the Official Sponsor of Madonna's Sticky & Sweet Tour. Not only were ALL the Tickets Labeled "Presented By Blackberry Bold" but there were BB Bold Booths, Blackberry Hospitality Rooms, and before the concert started there were NUMEROUS BlackBerry Commercials marketing the Bold as the New "Trendsetting Device". There was even a Special Section for RIM Employees. The microsite features concert dates and tour details, information on the BlackBerry Bold (sign-up for release updates is coming soon), retrieval of your concert photo (Bold Ambassadors are snapping pics at the concert which you can pull from the site later) and even has some sweet Madonna wallpapers available for download so you can personalize your BlackBerry Bold. Too bad you can't actually buy an AT&T BlackBerry Bold yet to personalize. D'oh!! 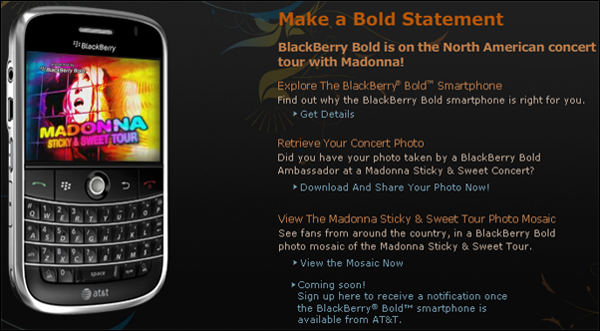 Ahh well.. you should still check out the Madonna BlackBerry Bold Site!